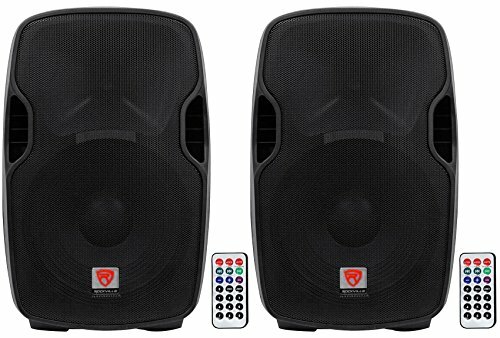 The Rockville BPA15 15" powered PA speaker has superior sound quality and power to anything at this price point. At Rockville we cut out all the middle men and deliver the best professional products at the best prices. This speaker has an incredible 800 watts of peak power and will deliver a massive amount of highs, mids, and Bass. This speaker is super-efficient. Line RCA and XLR input with separate Volume adjustment. Frequency Response: 20Hz-20KHz with Maximum SPL @1w/1m: 128dB peak / 125dB continuous and a bluetooth signal input. Now you can input any audio signal from your Bluetooth enabled music player or phone. No cables necessary! Bluetooth range is 32 feet. USB/SD digital MP3 music player. Input audio signals, special effects, any preprogrammed audio file and amplify it through your system and a wireless remote control. Enjoy the added convenience of being able to adjust any of the MP3 player functions, including volume, from the included wireless remote.